DNA double-strand breaks (DSBs) are cytotoxic lesions that will lead to genomic instability or even tumorigenesis if left unrepaired or misrepaired. To maintain homeostasis, cells have evolved two major repair pathways to counteract DSBs: classical non-homologous end joining (c-NHEJ) and homologous recombination (HR). Two other modes for repairing DSBs have been described: alternative non-homologous end joining (alt-NHEJ) and single-strand annealing (SSA). c-NHEJ ligates adjacent DSB ends directly with rapid kinetics throughout interphase, while HR meticulously initiates DNA-end resection in late S or G2 phase when sister chromatids are available as repair templates. Although partially sharing the DNA-end resection procedure with HR, alt-NHEJ and SSA often contribute to chromosomal translocation and genome rearrangement. Selection of the appropriate pathway to repair DSBs helps to maintain genome integrity. Here, we review current knowledge of the mechanisms regulating DSB repair pathway choice. Our genomic integrity is continuously threatened by cytotoxic agents that give rise to different types of DNA lesions (Hoeijmakers 2009; Shiloh and Lehmann 2004). DNA double-strand breaks (DSBs) disrupt the physical continuity of the chromosome and are one of the most deleterious lesions (Ciccia and Elledge 2010; Panier and Durocher 2013; van Gent et al. 2001). 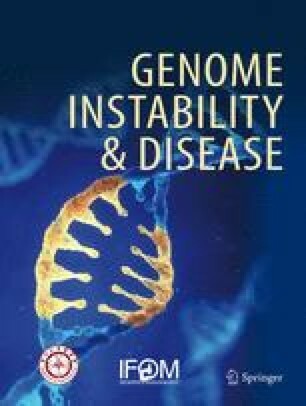 DSBs always result in genomic instability, tumorigenesis, or cell death if left unrepaired or repaired inappropriately (Hakem 2008; Jackson and Bartek 2009; O'Driscoll 2012). To ensure genome integrity and cell homeostasis, cells employ two major mechanisms to repair DSBs: classical non-homologous end joining (c-NHEJ) and homologous recombination (HR). Both pathways are highly conserved from yeast to human (Lieber 2010; Panier and Durocher 2013; San Filippo et al. 2008). c-NHEJ is active throughout interphase and involves the direct ligation of the two DNA ends with simple end trimming (Davis and Chen 2013; Lieber 2010). The rapid kinetics of c-NHEJ protect genome integrity regardless of its mutagenicity as a result of DSB end trimming (Difilippantonio et al. 2000). Once DSBs appear, the heterodimer Ku70/Ku80 recognizes and binds the broken DSB ends (Jin and Weaver 1997; Spagnolo et al. 2006). Subsequently, the DNA-dependent protein kinase catalytic subunit (DNA-PKcs) is recruited to the broken ends and is activated to phosphorylate itself and its targets, including Artemis, which trims DSB ends via its nuclease activity (Goodarzi et al. 2006; Ma et al. 2002, 2005; van der Burg et al. 2009). Ultimately, the ligase complex composed of DNA ligase IV, the scaffolding proteins X-ray cross-complementing protein 4 (XRCC4) and XRCC4-like factor (XLF), and the newly identified PAXX (paralog of XRCC4 and XLF), re-ligates the blunt DNA ends (Ahnesorg et al. 2006; Andres et al. 2007; Grawunder et al. 1998a, b; Kumar et al. 2016; Li et al. 2008; Ochi et al. 2015; Schar et al. 1997; Teo and Jackson 1997; Wilson et al. 1997; Zha et al. 2007). Distinct from c-NHEJ, HR takes place in S/G2 phase when sister chromatids are available as a repair template, so HR is commonly considered to be an error-free pathway (Heyer et al. 2010; Liu and Huang 2014; San Filippo et al. 2008; West 2003). Initiated with two-step DNA-end resection in the 5′ → 3′ direction, the broken DSB ends expose long 3′ ssDNA overhangs that are protected by the ssdna-binding protein RPA (Liu and Huang 2016; Sung and Klein 2006; Symington and Gautier 2011). Then, with the help of accessory proteins, such as BRCA2 and RAD51 paralogs, RAD51 recombinase displaces RPA to form RAD51-ssDNA filaments (Badie et al. 2010; Davies et al. 2001; Jensen et al. 2010; Renkawitz et al. 2014; Sy et al. 2009; Taylor et al. 2015; Thorslund et al. 2010; Xia et al. 2006; Zhao et al. 2015). The resulting filaments catalyze strand invasion to form a triple-stranded structure known as a displacement loop (D-loop), followed by DNA synthesis and ligation of the recombination products (Liu and Huang 2014; San Filippo et al. 2008; Teo and Jackson 1997; West 2003). 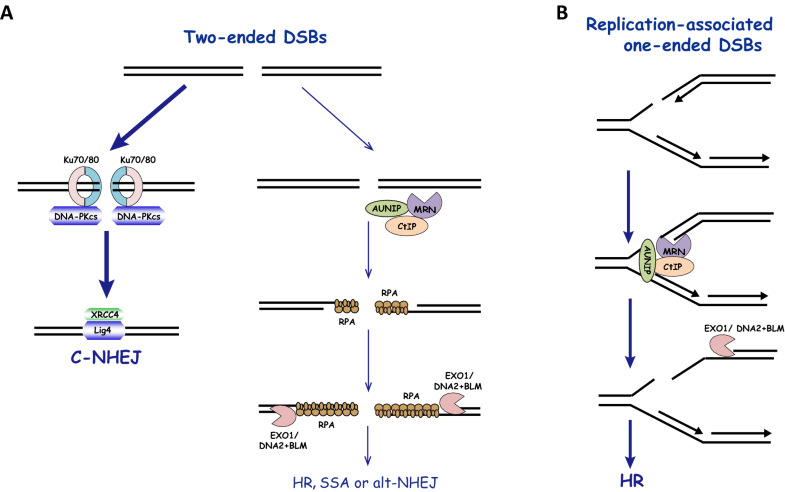 In addition to the extensively studied c-NHEJ and HR pathways, two other pathways that deal with DSBs have been reported: alternative non-homologous end joining (alt-NHEJ) and single-strand annealing (SSA) (Bhargava et al. 2016; Deriano and Roth 2013; Ramakrishnan et al. 2018; Sfeir and Symington 2015). Alt-NHEJ was originally discovered in c-NHEJ-deficient cells as a backup pathway to repair DSBs (Deriano and Roth 2013; Sfeir and Symington 2015). Consistent with this, substantial class switch recombination (CSR) occurs via the alt-NHEJ pathway in XRCC4- or Lig4-deficient cells (Deriano and Roth 2013; Sfeir and Symington 2015). Recently, it was shown that alt-NHEJ takes place in both c-NHEJ-proficient and -deficient cells (Bennardo et al. 2008; Boboila et al. 2010; McVey and Lee 2008; Wang et al. 2003; Yu and McVey 2010). Alt-NHEJ initiates with end processing to expose microhomology (25 nt) internal to the broken ends (Boboila et al. 2010; Rass et al. 2009; Xie et al. 2009; Zhang and Jasin 2011). Subsequently, poly(ADP-ribose) polymerase 1 (PARP1) and DNA polymerase θ (Polθ) promote DSB synapsis and microhomology annealing (Audebert et al. 2004; Kent et al. 2015). The resulting non-complementary 3′ flaps are then removed by nucleases and the single-strand gaps flanking the annealed microhomology are filled by the low-fidelity polymerase Polθ (Chan et al. 2010). Finally, DNA ligase 1 and 3 ligate the remaining nicks to complete the repair (Lu et al. 2016; Wang et al. 2005). Emerging evidence indicates that alt-NHEJ could result in excessive deletion of genetic information flanking the microhomology and chromosomal translocations caused by joining DSBs on different chromosomes and thus has harmful consequences for genomic integrity (Simsek and Jasin 2010; Zhang and Jasin 2011). SSA shares a two-step DNA-end resection procedure with HR and occurs specifically when the resection products contain a repetitive homology ( > 100 nt) oriented in the same direction (Bhargava et al. 2016; Symington and Gautier 2011). Once the interspersed nucleotide repeats are exposed, RAD52 is involved in catalyzing the reannealing of RPA-coated homologous repeat sequences (Bhargava et al. 2016; Symington 2002). Subsequently, XPF associates with ERCC1 to remove the non-homologous 3′ ssDNA tails flanking the repeats (Bhargava et al. 2016). The resulting gaps are then filled by DNA polymerase and sealed by DNA ligase. SSA is relatively mutagenic because it can cause a deletion rearrangement between the repeats (Bhargava et al. 2016). Selection of the optimal repair pathway from among these four options helps to maintain genome integrity. Here, we discuss pivotal factors involved in repair pathway choice in mammalian cells to elucidate how cells regulate DSB repair efficiently. Under the current model of DSB repair, c-NHEJ is considered to be the predominant DSB repair pathway because it can start throughout interphase using blunt DSB ends (Davis and Chen 2013; Lieber 2010). The other three pathways are restricted to S or G2 phase because of their reliance on 3′ ssDNA overhangs generated by DNA-end resection (Ceccaldi et al. 2016; Liu and Huang 2016; Symington and Gautier 2011). To this end, DNA-end resection, which catalyzes the nucleolytic degradation of broken ends in a 5′ → 3′ direction, likely regulates pathway choice. DNA-end resection is carried out via a two-step process that consists of the initial resection, followed by extensive resection (Liu and Huang 2014; Longhese et al. 2010; Mimitou and Symington 2011; Sunada et al. 2016; Symington and Gautier 2011). In the first step, the MRE11-RAD50-NBS1 (MRN) complex and associated CtIP protein initiate resection with relatively few base pairs at the break ends. This makes the DSB ends available for alt-NHEJ (Huertas and Jackson 2009; Paull 2018; Truong et al. 2013). In the second step, the short clipped ends are further processed by BLM-DNA2 and EXO1 to generate long stretches of ssDNA, allowing the execution of HR or SSA (Huertas 2010; Mimitou and Symington 2009). Consequently, the 3′ overhang generated by DNA-end resection not only inhibits NHEJ, which prefers blunt DNA ends, but also dictates the choice among the other three pathways (Ceccaldi et al. 2016; Liu and Huang 2014). End resection plays a crucial role in settling the competition among repair pathways (Ceccaldi et al. 2016; Huertas 2010; Symington and Gautier 2011). The cell cycle phase regulates end resection since cyclin-dependent kinases (CDKs) phosphorylate several key factors that activate resection and simultaneously weaken the impediments to end resection (Aylon et al. 2004; Ferretti et al. 2013; Hustedt and Durocher 2016; Ira et al. 2004; Symington and Gautier 2011). Consistent with this notion, DSBs favor c-NHEJ repair over resection-dependent repair (HR, alt-NHEJ, and SSA) in non-cycling cells (cells are not dividing) because the resection of DSB ends is greatly reduced (Ceccaldi et al. 2016; Symington and Gautier 2011). In cycling cells (cells undergo division), although the role of CtIP in promoting end resection is not fully understood, the phosphorylation of CtIP by CDKs is certainly involved in the cell cycle regulation of DNA-end resection (Anand et al. 2016; Sartori et al. 2007). In mammalian cells, CDK-dependent CtIP phosphorylation promotes the CtIP-BRCA1 interaction in S/G2 phase, possibly stimulating DNA-end resection (Reczek et al. 2013; Yu and Chen 2004; Yu et al. 1998; Yun and Hiom 2009). Notably, CDK-dependent phosphorylation of CtIP is a prerequisite for ATM to phosphorylate CtIP, which is important for end resection (Wang et al. 2013). By contrast, CDK2-mediated phosphorylation of CtIP on Ser276 and Thr315 facilitates CtIP interaction with the cis–trans prolyl isomerase PIN1 and subsequent isomerization (Steger et al. 2013). Isomerization of CtIP leads to CtIP polyubiquitination and degradation and thus counteracts DNA-end resection (Steger et al. 2013). Further research is needed to determine how the complex, multi-site phosphorylation of CtIP is integrated in cell cycle regulation of resection. CDK-dependent phosphorylation of EXO1 and NBS1 also promotes end resection (Falck et al. 2012; Tomimatsu et al. 2014; Wohlbold et al. 2012). In addition to positive regulation of the main factors involved in end resection, CDKs also weaken the impediment to end resection. The recently discovered ssDNA translocase-DNA helicase B (HELB) is recruited to resected DSB ends via RPA to inhibit DNA-end resection via its translocase activity (Guler et al. 2012; Tkac et al. 2016). The nuclear export of HELB stimulated by CDK2 phosphorylation destroys HELB-dependent block to resection when cells enter S phase, enabling end resection (Gu et al. 2004; Tkac et al. 2016). Otherwise, cyclins play non-canonical roles in promoting end resection. As reported, cyclin A2 acts as an RNA-binding protein to up-regulate MRE11 abundance in S phase (Kanakkanthara et al. 2016). Besides the cell cycle, the DSB end structure is another factor that affects the repair pathway choice (Chapman et al. 2012; Liu and Huang 2014; Shibata 2017; Wyman and Kanaar 2006). DSBs are separated into one- and two-ended DSBs (Shibata 2017) (Fig. 1). One-ended DSBs are generated when replication forks encounter single-strand breaks (SSBs). Agents that introduce SSBs or inhibit SSB repair induce replication-associated DSBs, such as camptothecin (CPT, a DNA topoisomerase I inhibitor) and PARP inhibitors. By contrast, two-ended DSBs are induced directly by ionizing radiation (IR) or etoposide (a DNA topoisomerase II inhibitor). Replication-associated one-ended DSBs are preferentially repaired by HR owing to the lack of another DNA end for end joining (Bunting et al. 2010; Lord and Ashworth 2013; Wang et al. 2001a). Nevertheless, in late S/G2 phase, when end resection is available, c-NHEJ still repairs ∼ 70% of two-ended DSBs so that HR-deficient cells are more tolerant to irradiation than NHEJ-deficient cells (Shibata 2017; Shibata et al. 2011; Wang et al. 2001b). Recent data imply that the Ku complex binds to DSBs regardless of the cell cycle stage and the structure of DSB ends, protecting the DNA ends from resection at both one- and two-ended DSBs (Biehs et al. 2017; Chanut et al. 2016; Sun et al. 2012). The removal of Ku from DSB ends is a prerequisite for DNA-end resection (Chanut et al. 2016; Mimitou and Symington 2010; Sun et al. 2012). As reported in human cells, the nuclease activity of MRE11 and ATM-dependent phosphorylation of CtIP are required to remove the Ku complex from DSB ends (Brown et al. 2015; Feng and Chen 2012; Ismail et al. 2015; Langerak et al. 2011). Furthermore, the CtIP-interacting protein that we recently identified, AUNIP/C1orf135, acts as a critical determinant of end resection, which commits cells to homology-dependent repair pathways. AUNIP shows a strong binding preference for DNA substrates that mimic stalled replication forks (Fig. 1). Relying on this structure-specific DNA-binding activity, AUNIP and its interacting partner CtIP translocate to replication-associated one-ended DSBs to initiate end resection (Fig. 1). By comparison, AUNIP has low affinity for blunt DSB ends, so that CtIP may not be fully activated at two-ended DSBs to counteract the Ku complex, which explains why two-ended DSBs are predominantly repaired by NHEJ (Lou et al. 2017) (Fig. 1). In addition to the nature of DSBs, accumulating evidence implies that the chromatin structure around DSB sites determines pathway choice (Aymard et al. 2014; Shibata et al. 2011). Eukaryotic DNA is wrapped around histone octamers to form nucleosomes and is further folded to form condensed chromatids; this enables packing of long genetic molecules into the relatively small nucleus (Simpson et al. 1978). However, this condensed structure forms a barrier to DNA metabolism, including transcription, replication, and repair (Hauer et al. 2017). Once DNA damage occurs, multiple histone-modifying and chromatin-remodeling proteins are recruited to facilitate DNA repair by modifying the structure of chromatin to overcome the restricted access to DNA (Clapier and Cairns 2009; van Attikum and Gasser 2005). Chromatin remodelers are large multi-subunit complexes that use the energy from ATP hydrolysis to modify chromatin structure by altering histone-DNA interactions, histone displacement, and nucleosome mobility (Clapier and Cairns 2009). Several chromatin-remodeling proteins have been reported to overcome the natural barrier of chromatin to promote end resection, including INO80, SWR1, SMARCAD1/FUN30, and SRCAP (Chambers and Downs 2012; Chen et al. 2012; Costelloe et al. 2012; Dong et al. 2014; Morrison et al. 2004; Shim et al. 2005, 2007; van Attikum et al. 2004). For example, SRCAP forms a complex with the key resection factor CtIP and is required for the accumulation of CtIP at DSB sites. In contrast to SRCAP, SMARCAD1/FUN30 facilitates extensive Sgs1- and EXO1-dependent resection. Further study is needed to determine how these chromatin remodelers collaborate to conduct efficient end resection. 53BP1 is rapidly localized to DSB sites by recognizing histone methylation (H4 Lys20) and ubiquitination (H2A Lys15) (Botuyan et al. 2006; Fradet-Turcotte et al. 2013; Wilson et al. 2016). The role of 53BP1 in blocking end resection was first characterized in a study that showed the loss of 53BP1 restored defective HR repair and alleviated the PARPi sensitivity of BRCA1-mutated mice (Bunting et al. 2010; Daley and Sung 2014; Zimmermann and de Lange 2014). Subsequent findings implied that ATM phosphorylates the 53BP1 N-terminal region, which in turn promotes the recruitment of PTIP and RIF1 to limit DNA-end resection (Callen et al. 2013; Chapman et al. 2013; Escribano-Diaz and Durocher 2013; Escribano-Diaz et al. 2013; Feng et al. 2013; Silverman et al. 2004; Zimmermann et al. 2013). The function of PTIP in blocking end resection involves its downstream nuclease Artemis, which trims DSB ends to promote c-NHEJ (Wang et al. 2014). By contrast, RIF1 recruits the newly identified Shieldin complex and CYREN to protect DSB ends from resection (Arnoult et al. 2017; Dev et al. 2018; Gao et al. 2018; Ghezraoui et al. 2018; Gupta et al. 2018; Mirman et al. 2018; Noordermeer et al. 2018; Zlotorynski 2018). BRCA1 antagonizes the end-protection activity of 53BP1 and its downstream factors to allow the activation of DNA-end resection in S/G2 cells followed by resection-dependent repair (Bunting et al. 2010; Daley and Sung 2014; Zimmermann and de Lange 2014). 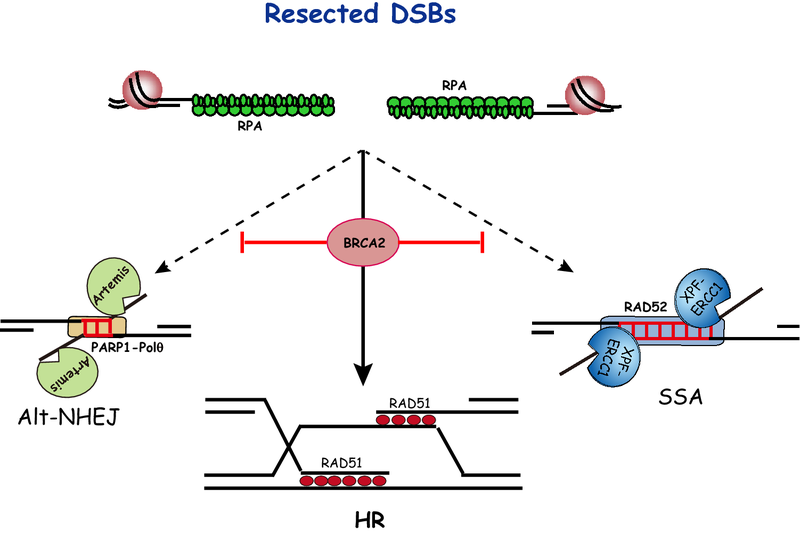 While in G1 phase, 53BP1 and RIF1 suppress the recruitment of BRCA1 to DSB sites (Callen et al. 2013; Chapman et al. 2013; Escribano-Diaz and Durocher 2013; Escribano-Diaz et al. 2013; Feng et al. 2013; Silverman et al. 2004; Zimmermann et al. 2013). Therefore, 53BP1-RIF1-PTIP and BRCA1 are engaged in a battle at DSB ends to promote either end protection or resection. Accessory factors that modulate end resection also contribute to repair pathway choice. For example, the exonuclease EXD2 and dNTP triphosphohydrolase SAMHD1 are reported to promote HR by accelerating end resection (Arnoult et al. 2017; Cabello-Lobato et al. 2017; Daddacha et al. 2017). Although DNA-end resection plays a vital role in repair pathway choice, our knowledge of end resection and its regulation in mammalian cells is limited. More complex regulatory mechanisms of end resection will likely be uncovered with the development of new approaches and techniques. Once end resection is initiated, the c-NHEJ pathway is prevented and any of the three resection-dependent pathways can be initiated (Ceccaldi et al. 2016). The initial resection creates a relatively limited 3′ overhang, which is available for alt-NHEJ. By contrast, extensive resection generates long stretches of ssDNA that are suitable for HR and SSA (Ceccaldi et al. 2016). In addition to the length of the ssDNA overhang, the RPA heterotrimer associates with resected DNA to prevent spontaneous annealing between homologous DNA molecules (Deng et al. 2014). RAD52 and Polθ have been shown to overcome the inhibitory effect of RPA, thereby stimulating ssDNA annealing and DSB repair by SSA or alt-NHEJ (Kent et al. 2015; Ochi et al. 2015; Sugiyama et al. 1998) (Fig. 2). Strikingly, our recent work showed that the tumor suppressor BRCA2 is able to antagonize the 53BP1-RIF1-Artemis axis at extensively resected DSBs to inhibit c-NHEJ, alt-NHEJ, and SSA in a RAD51-independent manner (Han et al. 2017) (Fig. 2). Efficient, accurate repair of DSBs suppresses genomic instability, which is a driver of tumorigenesis. The genome is protected by picking the appropriate pathway to repair DSBs from among four possible mechanisms: NHEJ, HR, alt-NHEJ, and SSA. We have discussed the role of DNA-end resection in DSB repair choice. The nature of the DSB ends, the cell cycle stage, and multiple repair proteins coordinate to make the choice of DNA-end resection. Once it occurs, the initial and subsequent extensive resections lead to divergence in the choice among the three repair pathways that rely on 3′ overhangs. Meanwhile, the tumor suppressor BRCA2 stabilizes the RPA-coated ssDNA stretches produced by DNA-end resection to antagonize annealing and digestion, so BRCA2 plays a role in pathway choice besides recruiting RAD51. Currently, error-prone DSB repair pathways are considered important for cell viability when the error-free repair pathway is disabled. Understanding the mechanisms that regulate DSB repair pathway choice may shed light on new synthetic lethal targets and drug development for HR-deficient patients. We apologize to colleagues whose work could not be cited due to space limitations. We thank all our colleagues in the Huang laboratory for insightful discussions. This work was supported in part by National Natural Science Foundation of China (Grant no. 81661128008, 31730021, 31571397, and 3170040161) and the Fok Ying Tung Education Foundation.